Earaches can be very painful and come on very suddenly. The reason for the pain is quite simple. Through the accumulation of fluid and the clogged Eustachian tube, the pressure equalization in the middle ear can no longer take place. The Eustachian tube is normally filled with air, but when the air is replaced by the body through the liquid, the resulting pressure on the eardrum causes the pain. The underlying disease is simple, most of the time. In principle, the ear has a cold and is plugged up. The cause is usually a virus. Therefore, antibiotics are not useful since they work on bacterial infections only.They eliminate neither the pain faster nor reduce the risk of complications. If you are also running a fever and the wrap does not bring relief in a couple of days, do see your doctor though to rule out a bacterial infection. The objective of the compress is to get the onion fumes in the ear. The essential oils of the onion have a strong expectorant, the build up of secretion is thus eliminated and the pressure and the pain subside. Of course onions. One or two are sufficient, the kind that make you cry, are the best! You also need a cotton sock or a cotton handkerchief or towel. Peel the onion and cut it into small pieces. Fill the pieces into the (clean) sock or fold them into the handkerchief or towel. The preferred application is a warm wrap. Place the onion pieces into a microwave until warm (times vary by Microwave and how many onions you have, start with 30 seconds or so). Make sure they are not too hot before placing on ear, you should only have one layer of cotton fabric between the onions and the ear, so the oils and fumes can reach the ear. Do not try to stick onion pieces into the ear canal. Place the onions (in sock or cotton material) on the ear, wrap something around to keep in place, like a bandana, hat or scarf or another towel. It’s easiest if you lay down so the wrap will stay in place. 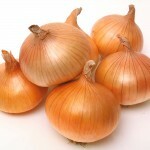 If you do not have a microwave, heat the onions with steam, do not place them in water or they will loose their oil. Leave on ear for up to an hour! Use a rolling pin or something similar, like a bottle for example, to crush the onions just a little to release the oils. Place them on the ear and secure with a headband, hoodie or lay on them. The onion wrap also works wonderfully for a sore throat, you will need more onions and a larger piece of cotton of course, the rest of it is the same as with the wrap for the ear.